James: On January 22nd, 1927, BBC Radio broadcast a football match for the very first time - a Division 1 fixture between Arsenal and Sheffield United at Highbury. Former rugby player, Teddy Wakelam called the match that day. Sports broadcasting was so new that the Radio Times magazine published a diagram of a football pitch, divided into eight numbered squares. While Wakelam called the play, another voice would call out numbers corresponding to the area of the pitch the action was taking place. This allowed listeners to follow the match at home, using the grid. Hence the phrase “back to square one”. At the time, it was thought that radio coverage would affect match attendance and newspaper sales, but by 1931 the BBC were broadcasting over one hundred games a season. Six years later, they presented the first football match on live television. As football has grown, so too has the way we consume the sport. TV coverage now dominates, but radio still plays a crucial role. And at the core of these experiences is the human voice. The football commentator. Simon: You know, people think you just turn up to do commentary and it’s as simple as talking off the top of your head. I can assure you, it’s anything but. You know, it’s an art form, it’s a skill. James: This is Simon Hill…. Simon: Chief Football Commentator at Fox Sports. My first memory of commentary was the old BBC Radio 2 which was all the way back in the 1970s when I was living in the north of England. And the guys who i really idolised - well, there were two in particular. A guy called Peter Jones and his offsider Bryon Butler. Butler was actually my favourite because he had a very thick, chocolatey voice and just a hint of west country burr. And I thought he was quite intoxicating down the old telephone lines before the modern satellite hook-ups and he sort of evoked these images of far off lands. And as a kid that’s a very potent thing for your imagination. So yeah, they were probably the first two I remember and I think probably underlined, even at that early age - because I knew already that I wasn’t going to be good enough to be a footballer, 13, 14 I’m talking about - that you know I wanted a career in sports broadcasting. And Bryon Butler in particular was the one I wanted to be like. And I was very fortunate to meet him in later years - he’s long since passed away now - but I met him at a game between Blackburn Rovers and Swindon Town at the old County Ground many years ago and he was a smashing fella. So yeah, great memories of listening to those two in my childhood. 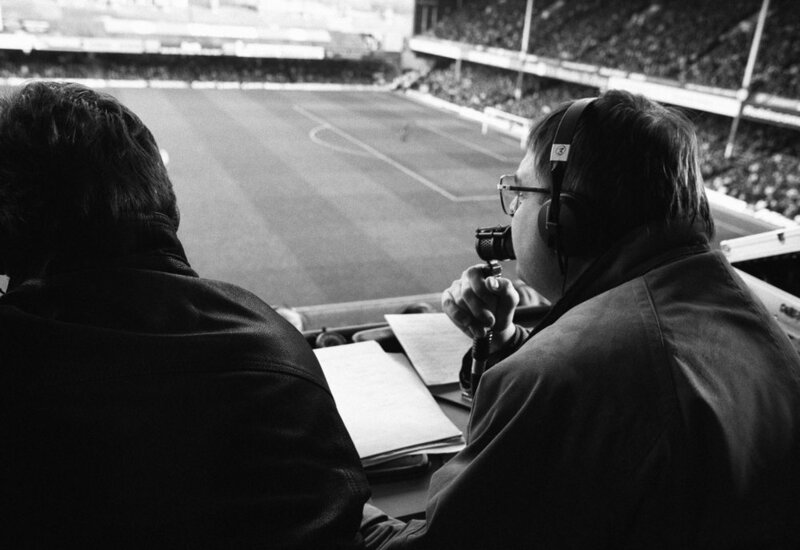 James: The central role of commentary is to keep you up to date and informed with how a football match is unfolding and naturally, this differs between radio and TV. Simon: I worked in radio for many, many years before I made the transition to television and to be honest, you know I found it quite hard, because radio in some ways is easier, in some ways more difficult. In radio you’ve obviously gotta find a lot more words because you are being descriptive as well as following the action. But TV can be tricky because you have to complement the pictures, so you’re almost trying to talk around the pictures in some ways. Obviously your basic skill is still, you know calling the correct name and keeping people up to date with the context of what’s unfolding in front of them. But in many ways, TV is a more disciplined art and can be quite tricky to perfect - in fact I’m not even sure you ever do perfect it, probably the same with radio - but I think in TV in particular because there’s a lot more scrutiny on you in television because more people tend to watch it. You have to pick your words maybe a lot more carefully that you do in radio. James: Traditionally, the role was filled by a solo commentator but over the years, co-commentators have become more common - often taken up by former players who offer a different perspective on the game. Simon: Your job is to follow the game and to announce the names in the correct order and obviously, hopefully identify correct goal scorers and put things into context as to what’s happening. And not necessarily why but what it means. And the nuances of the game are there for your co-commentator to dissect because you know, he’s the guy with the experience of playing the game at the highest levels. So the tactical side of thing is their department really. I always describe it as you know, we’re the how and when and what, and they’re the why. That’s the best way I can sort of describe it really. And obviously the two roles do bleed into each other a little bit, that’s inevitable. But I think these days, people have got a little bit confused as to what the roles mean. And in fairness, the media has encouraged that. They’ve encouraged us to become analysts of the game, you know, I’m described often these days as Fox Sports analyst. Well I’m not really, I’m a commentator. James: There have been some great commentator pairings over the years and I certainly appreciate the insider knowledge you get from a former player behind the microphone. But there is something intimate about a solo commentator, guiding you through a match. Simon: I’ve done a few of those in the past myself, and in fact I called solo for SBS at the 2006 World Cup and it’s sort of enjoyable in a different way. I think the problem today, if you asked me to do it, you know in the current day, I’m sure I could do it but it’s been so long that I’ve done it that it’s almost like a safety valve that, you know you have your offsider there, it’s become de rigueur to have a second commentator. When I was growing up it used to be the solo commentator and that was it. James: Don’t speak for a moment, yeah, and just let the match breathe, you know? Simon: Yep. It’s, look I’m probably as guilty of this as anybody these days. I think the propensity in the modern era is to overtalk. Certainly when you watch games back from the 60s and 70s you know, you become aware very quickly of how little the commentators actually spoke. These days we tend to talk across virtually every aspect of the game, which is probably wrong. I remember doing one of my early games for the national team and getting some feedback saying “I thought your microphone had broken because you didn’t speak for ten seconds. So it’s a subconscious thing but it tends to creep into your performance that you think “Oh I’ve been silent for 5 or 10 seconds, I’ve gotta say something”. But as you know, Richie Benaud once said - and it was brilliant, he was one of the masters at sports commentary, not football of course - but you know he said “if you’ve got nothing to say, say nothing”. And it’s great advice and unfortunately, none of us probably take that to heart enough these days. James: So, what kind of preparation actually goes into calling a football match? Simon: What I normally do - and every commentator different, they’ll have their own way of doing things - but I spend a full day on each domestic game. For international games it will be more than that because obviously there’s a bit more research involved when you’re doing teams like Honduras or Syria. But I still don’t skimp on the research. I make sure that I have what I call a main fact sheet, which contains information like last week's line-ups so I can note any changes in the team from week to week, who’s scored the goals for that particular season. Who’s out injured or suspended. And then a handful of facts which I label as trivia. And that’s basically to fit in in moments where there’s a bit of downtime in the game, there might be an injury or a delay or you might have an opportunity to throw in a fact that might be some use. You know, those little things which you can drop in which, hopefully are of interest to the viewer. You’ll never please everybody but you try and cover all bases in terms of knowledge of the team and also the individuals as well. There’s a mine of information at your fingertips, obviously, these days. We also get issued with statpacks on a weekly basis by the Fox Sports stats team. And obviously, I’ll watch clips of the games I might have missed. So, you know there’s a fair bit that goes into it and obviously it’s repeated on a weekly basis. I normally do two, sometimes three games a week. So you know, you’re kept fairly busy along with all the other stuff; podcasts and radio interviews and hosting shows, appearing on shows. So you know, during the season it’s pretty much 24-7, it’s a full time occupation. We don’t sit there when there’s no games, smoking cigars, as people seem to think we do haha! James: Yeah, pretty full schedule! So for say, an international game. How many hours of research would go into one match? Simon: I would say, probably three days worth, you know, three full working days. So probably 20 to 25 hours. And again, it depends on the team. If you know, Australia were playing England, well then that would be an easier games to research than if they’re playing Syria. James: And so on a given match day, what does your kind of day look like, leading up to actually calling a game? Any last minute preparations? I know a lot of commentators have a book and a lot of their notes are handwritten. Do you hand write stuff or do you print things out? How do you go about that? Simon: I do still have handwritten notes, yeah, I’m old school. My top sheet, as I call it, is all written in longhand. My two other sheets are printed off from the Soccer Commentators website, so it’s sort of a mixture of both really. In terms of my routine, it depends on where the game is. If it’s in Sydney then obviously I’ll be at home and I can have a more relaxed build up. I’ll probably not do too much during the day. I’ll look over my notes with a couple of hours before kickoff. And then it’s about travelling to the game. If you’re interstate, which obviously often we are, then the day of the game will probably involve travel itself. So we’ll get on a plane from say Sydney to Adelaide. And then you have gotta go and check into your hotel. By the time you’ve done all that you’re probably only two, three hours pre-kickoff. You might have a bit of a nap if you’re tired, you know it’s a pretty hectic schedule. So sometimes I’ll get a bit of shut-eye or a bite to eat at a local restaurant. And then, bang, you’re off either in a taxi or a car to the stadium. And your first port of call is normally the TV truck where you have to check in with your producer and find out if there are any last minute changes to the run-down. There are run-downs, even for live television games. I might go down the tunnel, have a look at the pitch, I’ll speak to people from either side. Maybe have a word with the referee. Get on very well with a lot of the referees. Contrary to popular belief, they only have one head and they’re normally pretty nice guys. And generally try and get a feel and get yourself settled into the moment for what’s about to transpire. But of course, the great thing about live television and about live football is that you never know what’s gonna happen during the 90 minutes. So you know, all the best laid plans can go out of the window within the first 30 seconds, just like being a coach or a player. James: Audio commentary plays a vital role in our viewing and listening experience. It has a way of capturing football moments that ingrain themselves in our memories. When I recall some of my own favourite moments of watching the Australian national team on TV, it’s Simon’s voice that immediately springs to mind. James: How big a role do you think, you know, commentary plays in how people remember special moments and matches, you know, and the way football history is recorded? Simon: I don’t think there’s any doubt that we’ve sort of become in many ways - and I’m trying not to overplay it, because obviously we don’t actually kick the ball and we don’t select the team - but you become a part of the moment. For example, the 2005 game against Uruguay, obviously Craig Foster and I, we called that night. And you know, probably Craig more than me have gone down in history for you know, screaming Johnny Warren and being involved in that seminal moment for the game. I’ve been you know very, very blessed in my commentary career, particularly since coming to Australia, that I’ve been behind the microphone for so many of those big games that have meant so much to so many people. And all you can do as a commentator is try and reflect the emotion of that particular day, that particular moment for the people you’re calling for and as a result you become sort of part of that history. James: The football world may be constantly changing, but for all its quirks and murky history, language is one aspect of the games culture we can always rely on to develop organically. James: By Association is produced by me, James Parkinson. Many thanks also to Adam Hurrey for contributing. You should definitley pick up a copy of his book Football Cliches. His Twitter account, of the same name, is also a must follow for some fun takes on the lighter side of football. And while you're there, which is your favourite football cliche? Let me know, @JamesRParkinson. And as always, your ratings, reviews and shares are much appreciated. Go and tell a friend about the show, grab their phone and make them subscribe. Thank you for listening. And for more from the show, check out the website, byassociation.audio where we always to love the game. Podington Bear - Conveyor Belt, Mello D, Twinkletoes, Window Shopping, Lunch.